As aircraft have increased in gross weights with higher landing airspeeds, the problem of stopping an aircraft after landing has greatly increased. In many instances, the aircraft brakes can no longer be relied upon solely to slow the aircraft within a reasonable distance, immediately after touchdown. Most thrust reverser systems can be divided into two categories: mechanical-blockage and aerodynamic-blockage. Mechanical blockage is accomplished by placing a removable obstruction in the exhaust gas stream, usually somewhat to the rear of the nozzle. The engine exhaust gases are mechanically blocked and diverted at a suitable angle in the reverse direction by an inverted cone, half-sphere, or clam shell. [Figure 1] This is placed in position to reverse the flow of exhaust gases. This type is generally used with ducted turbofan engines, where the fan and core flow mix in a common nozzle before exiting the engine. The clamshell-type or mechanical-blockage reverser operates to form a barrier in the path of escaping exhaust gases, which nullifies and reverses the forward thrust of the engine. The reverser system must be able to withstand high temperatures, be mechanically strong, relatively light in weight, reliable, and “fail-safe.” When not in use, it must be streamlined into the configuration of the engine nacelle. When the reverser is not in use, the clamshell doors retract and nest neatly around the engine exhaust duct, usually forming the rear section of the engine nacelle. In the aerodynamic blockage type of thrust reverser, used mainly with unducted turbofan engines, only fan air is used to slow the aircraft. 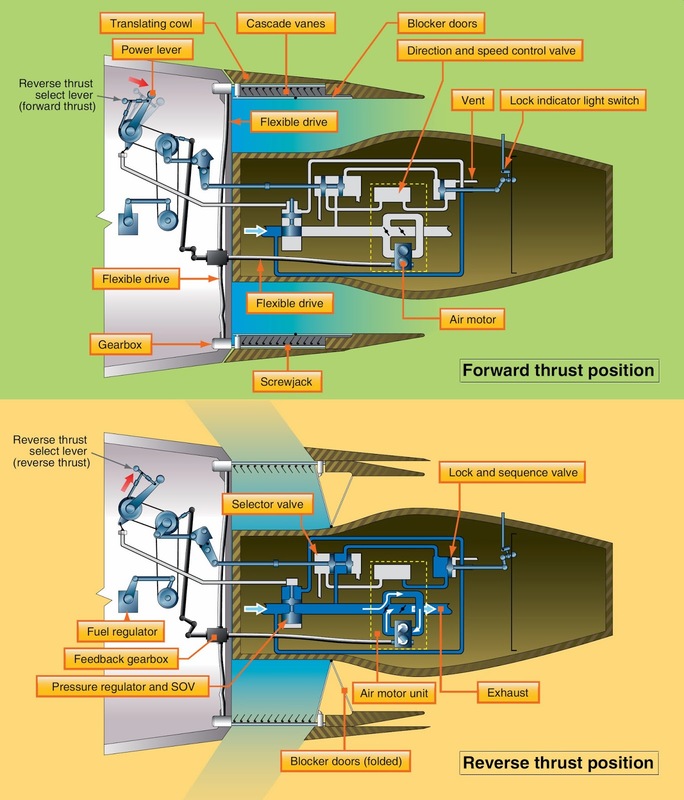 A modern aerodynamic thrust reverser system consist of a translating cowl, blocker doors, and cascade vanes that redirect the fan airflow to slow the aircraft. 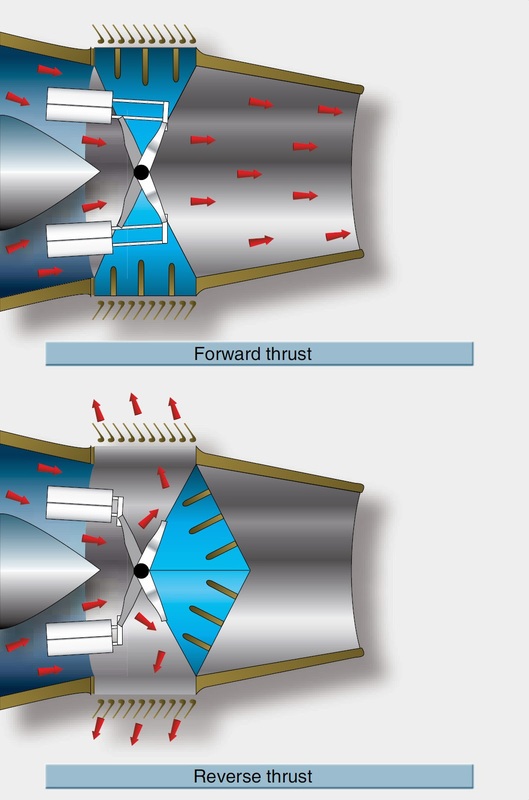 [Figure 2] If the thrust levers are at idle position and the aircraft has weight on the wheels, moving the thrust levers aft activates the translating cowl to open closing the blocker doors. This action stops the fan airflow from going aft and redirects it through the cascade vanes, which direct the airflow forward to slow the aircraft. Since the fan can produce approximately 80 percent of the engine’s thrust, the fan is the best source for reverse thrust. By returning the thrust levers (power levers) to the idle position, the blocker doors open and the translating cowl closes. A thrust reverser must not have any adverse affect on engine operation either deployed or stowed. Generally, there is an indication in the flight deck with regard to the status of the reverser system. The thrust reverser system consists of several components that move either the clam shell doors or the blocker door and translating cowl. Actuating power is generally pneumatic or hydraulic and uses gearboxes, flexdrives, screwjacks, control valves, and air or hydraulic motors to deploy or stow the thrust reverser systems. The systems are locked in the stowed position until commanded to deploy by the flight deck. Since there are several moving parts, maintenance and inspection requirements are very important. While performing any type of maintenance, the reverser system must be mechanically locked out from deploying while personnel are in the area of the reverser system.